Word has been received by his parents, Mr. and Mrs. Joseph Cipriano, that their son, Pvt. 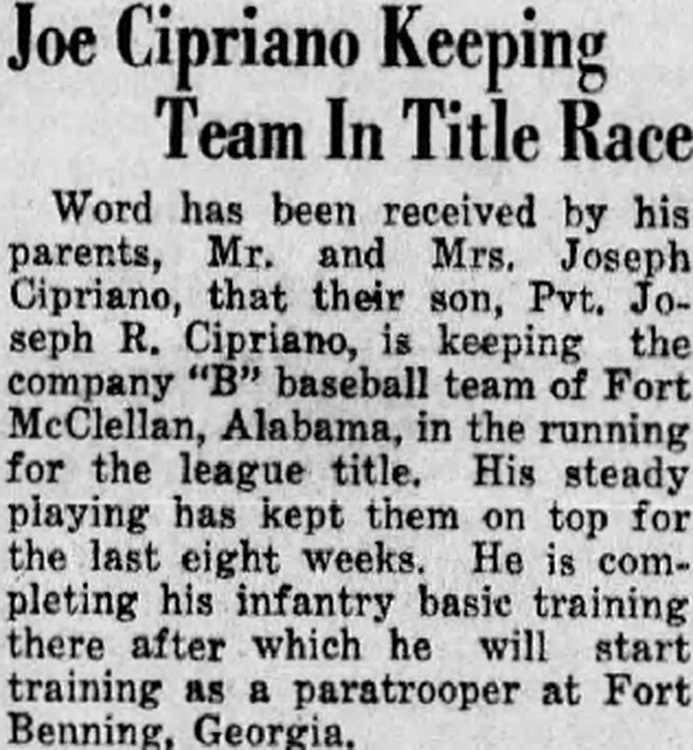 Joseph R. Cipriano, is keeping the company "B" baseball team of Fort McClellan, Alabama, in the running for the league title. His steady playing has kept them on top for the last eight weeks. He is completing his infantry basic training there after which he will start training as a paratrooper at Fort Benning, Georgia. 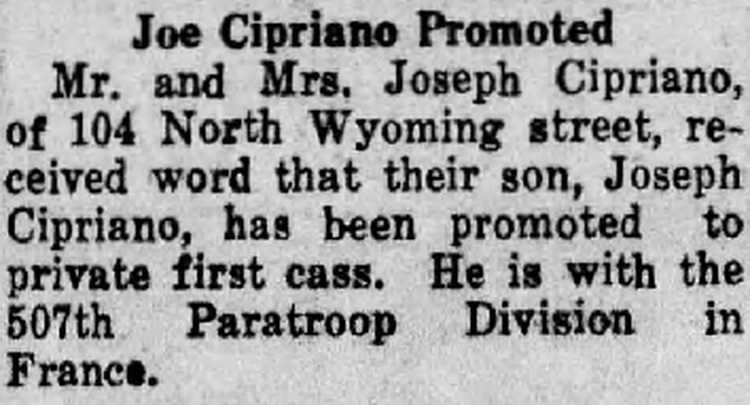 Mr. and Mrs. Joseph Cipriano, of 104 North Wyoming street, received word that their son, Joseph Cipriano, has been promoted to private first class. He is with the 507th [sic] Paratroop Division in France. Pfc. 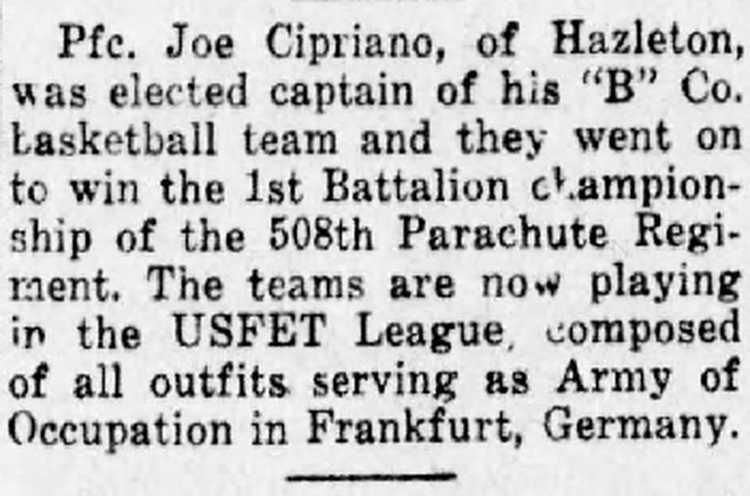 Joe Cipriano, of Hazleton, was elected captain of his "B" Co. basketball team and they went on to win the 1st Battalion champion- shin of the 508th Parachute Regirnent. The teams are nor playing in the USFET League, composed of all outfits, serving as Army of Occupation in Frankfurt, Germany. 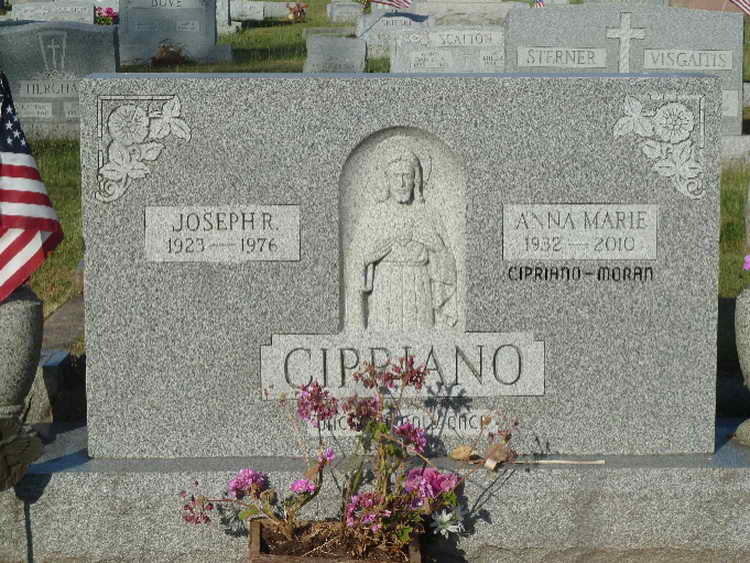 Pennsylvania WWII Veterans Compensation record and grave marker for Joseph R. Cipriano in the Most Precious Blood Cemetery, Hazleton (Luzerne county), Pennsylvania. 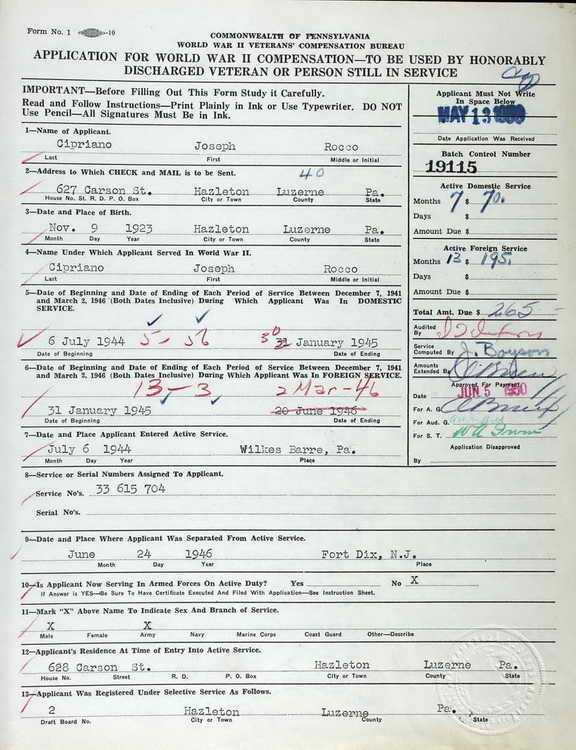 Joseph enlisted in the Army at Wilkes Barre, PA on 6 July 1944. Following completion of basic training and jump school he was sent to Europe. Om 8 March 1945 Pvt Cipriano was transferred from the 11th Reinforcement Depot to Company B, 508th PIR which was then posted to Sissonne, France. When the war ended the 508th was sent to Frankfort, Germany where it became the Honor Guard for General Eisenhower and Pfc Cipriano was amongst the men who performed that duty. .On 24 June 1946 he was discharged at Fort Dix, NJ. But, on 23 January 1951 he was called back to duty for the Korean Conflict and served until he was again discharged on 20 October 1952.